I’m British. Teeth aren’t one of my strong points – especially in this most vain teeth-whitening-straightening-perfection state of California. My first visit experience of a US dentist inflicted ‘shock and awe’ on their smiling white toothed faces. After inviting in their colleagues from next door I felt like an alien abductee as several faces peer into my gaping maw in shock and disbelief at what 36 years of British dentistry can do to a man’s teeth. I think I’m going to be good friends with my new dentist(s). 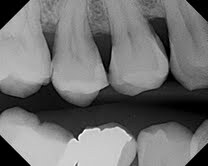 (Yes, the x-ray of the teeth above are mine). This entry was posted in Teeth by bulmer. Bookmark the permalink.